The Raccoons are a rockabilly band from Tasmania with a tough, wiry sound influenced by the British Teddy Boy Rock 'n' Roll style - this makes them an interesting alternative to the many rockabilly bands inspired by the original American style.Originally formed in 1987, The Raccoons finally cemented their current line up in 2012. The band, which plays mostly original materials they recorded their EP Slowburn during the winter months of 2014. 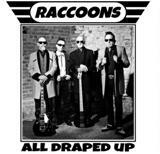 Established British label Raucous Records was suitably impressed by this EP, and signed up the band for their debut album All Draped Up.